The forecast has worsened since yesterday. 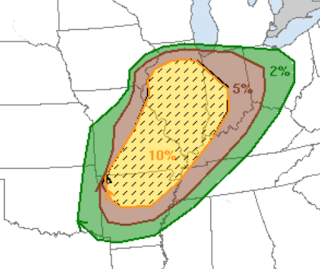 On this map the significant threshold for tornadoes is 5% (brown). The ten percent (yellow) is an elevated risk of violent tornadoes (hatched). This includes St. Louis, Little Rock and southwest suburbs of Chicago. If you live in the hatched area, I urge you to monitor the latest weather information at the first sign of thunderstorms this afternoon and tonight.